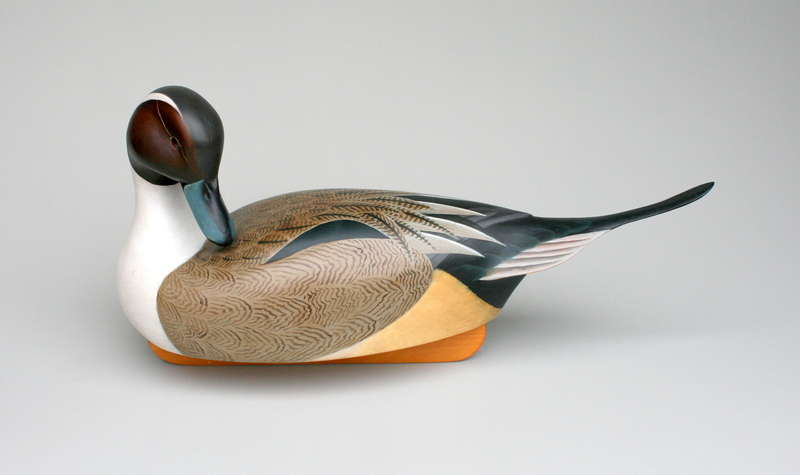 I think of this Drake Pintail as one of 2 quintessential Sanford decoratives – the Oldsquaw is the other “flagship”. Both give me lots of opportunity to include my thoughts about form and line and curves and even color. The difference, I suppose, is in the details. More specifically, the difference resides in the intricacies of the patterns on the feathers. It takes a lot of planning and work and fussing to get the look I want – but I really enjoy the Drake’s herringbone tweed cape. And I insist that the tail feathers and their coverts reflect a perfect, geometric progression in size and aspect. If I am successful, these details draw the viewer’s eyes ever closer. 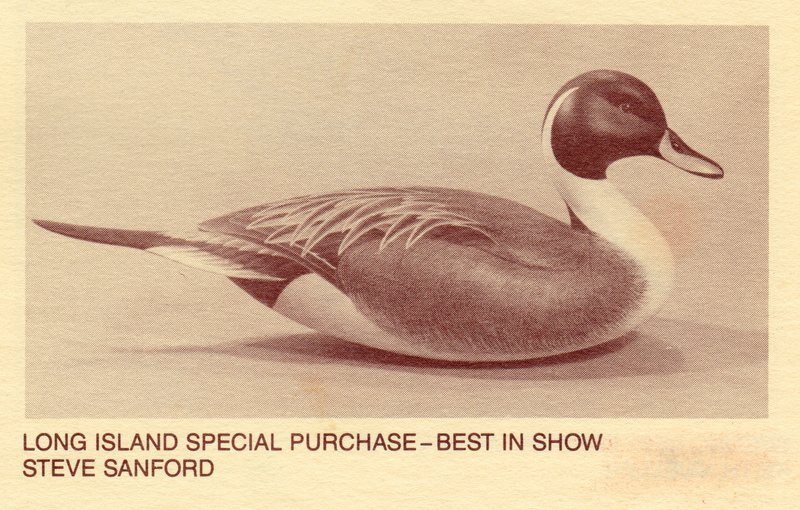 This Drake was my first Best-in-Show at the U. S. National Decoy Show in 1989. Its paint scheme has some softer edges and I still enjoy – all these years later – the droop in the tertials and scapulars. I drew the pattern for this carving in 1988 and have not made any substantive alterations since. 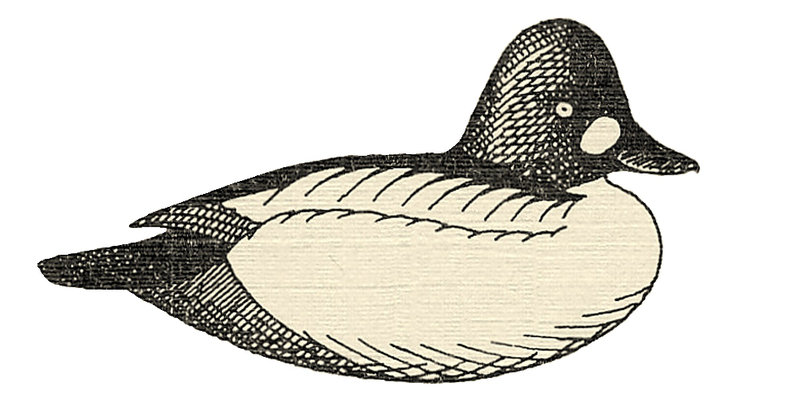 This bird was the subject of a video produced by DEC. The very professional crew filmed all day – the 4-minute finished product is available at and also on . 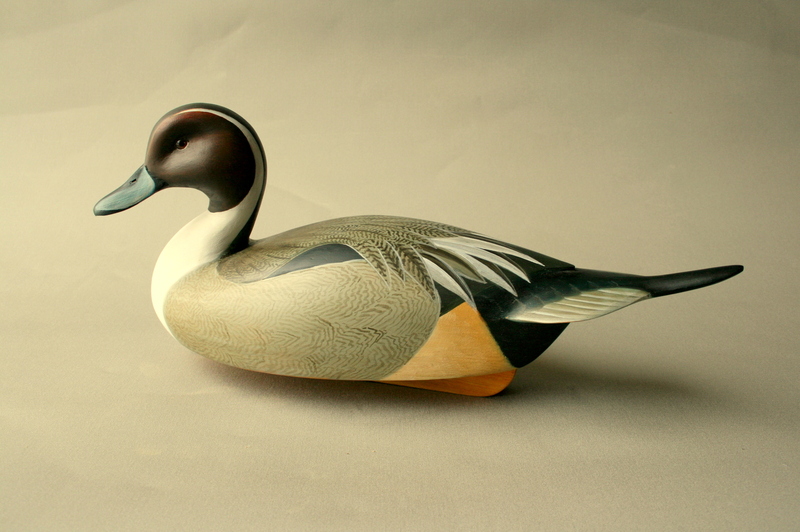 I put a gunning paint job on this bird for the video but later removed it – so I could spend 10 or 15 hours more to get it just right for my Dad’s Eightieth birthday gift. 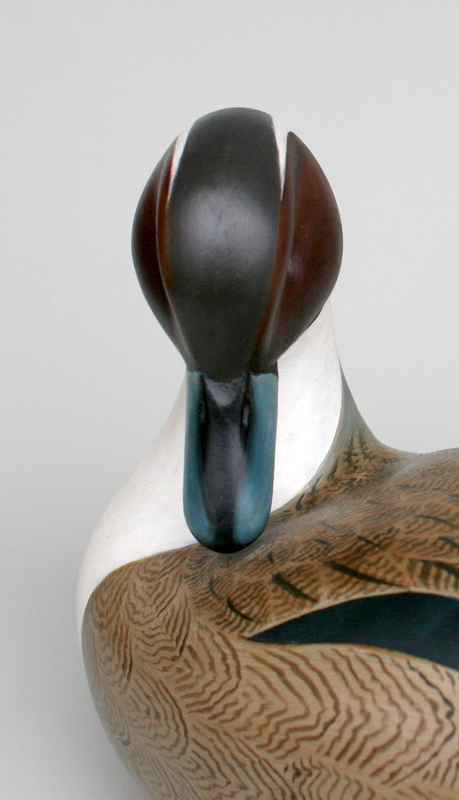 Pintails provide me the most opportunity for “playing with curves” – and I sometimes override Mother Nature – as when I carry the white up over the eye. I know it’s “wrong” – but I just cannot help myself. 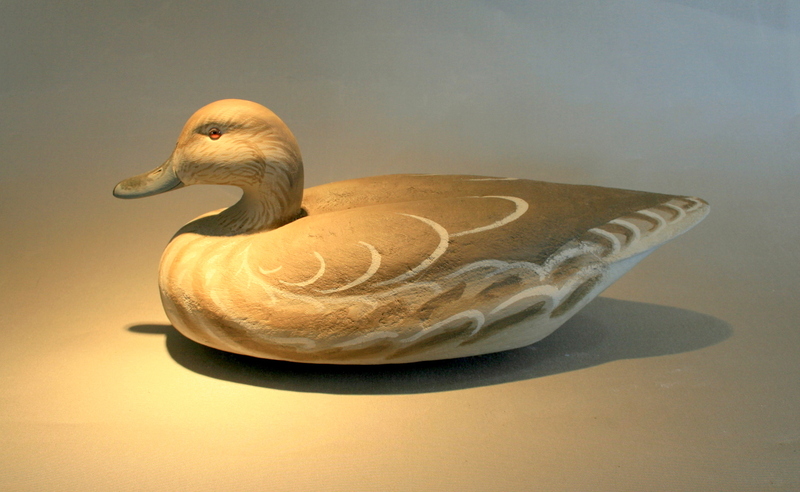 This Drake was carved and painted at about the same time as the one I did for my Dad. Just as cooking shows do, I had two different birds – one ready to paint – for the cameras. This one, though, was for a Fiftieth Birthday for a close friend. This pair is part of my personal gunning rig. 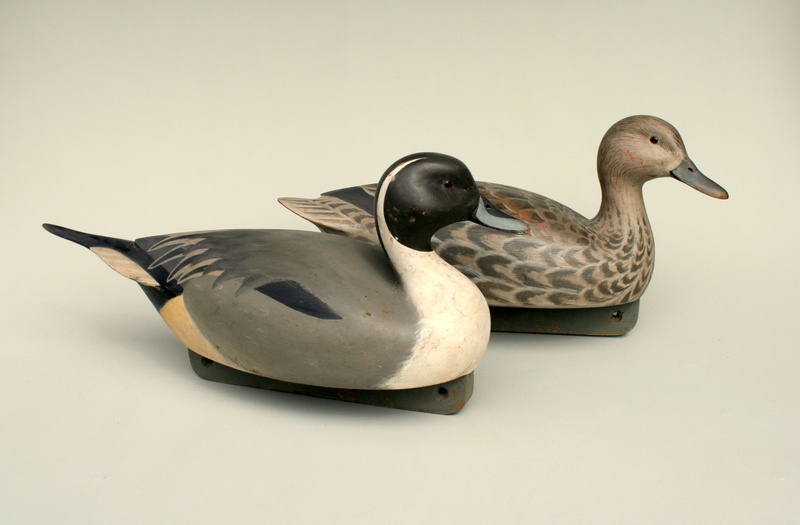 I made them – along with a pair of Shovelers – to add some color to my cork Black Ducks. They are hollow White Pine. 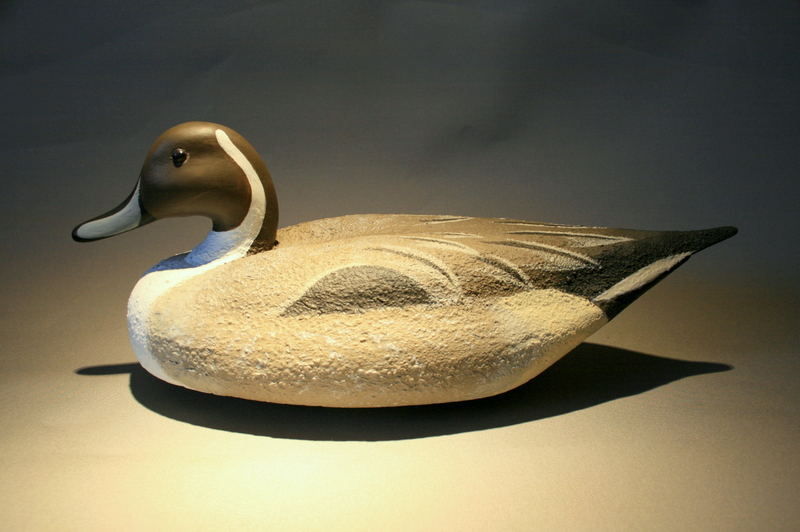 The Drake has a hardwood tail insert – maybe White Oak – that I reinforced with ‘glass and epoxy. Here are the gunners at work – in a “salt pond” up inside the marsh. 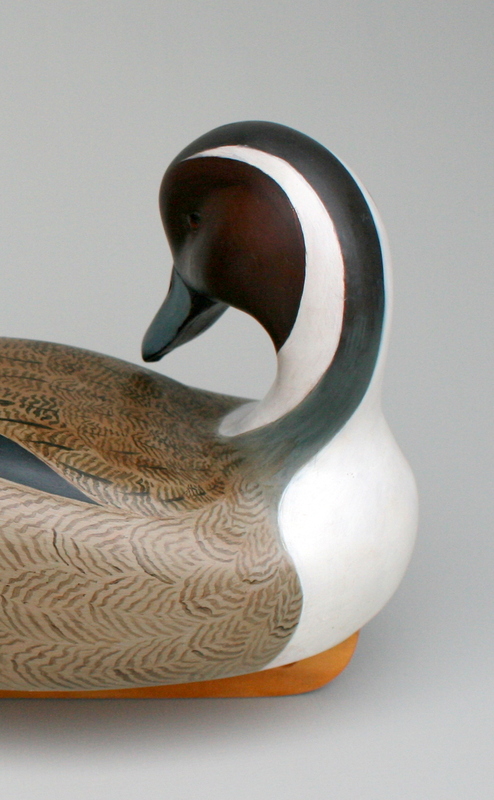 I re-painted these 2 factory birds – sold through Cabelas? – for a good friend. 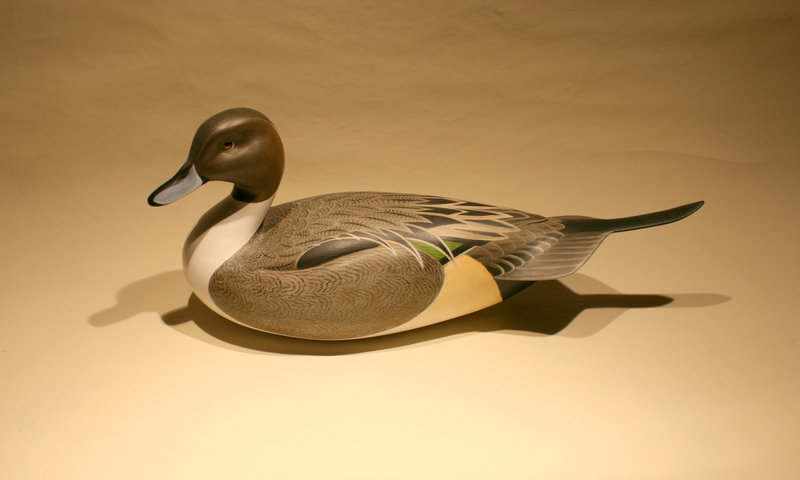 The speed and simplicity of gunning bird patterns allows for a very free painting style – every minute is a pleasure.